Building stealth antennas to keep prying eyes from detecting your communications resources takes some skill and a lot of ingenuity. The skill part comes into play when it comes down to building antennas that will be sturdy and will perform optimally for the frequency/band desired. The ingenuity part of a stealth antenna comes about when it comes to hiding the antenna from nosy people with nothing better to do than to concern themselves with YOUR antenna. 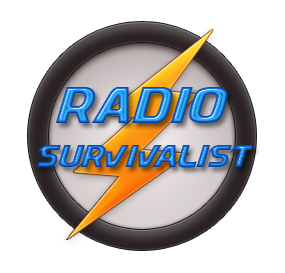 A lot of survivalists and others who want to hide their communications antennas think that mostly wire antennas are the type of antennas used the most and for the most part that’s fairly true. But that doesn’t mean that your HF/VHF/UHF beams and vertical antennas can’t be also hidden. In this picture to the right, you can see how easily a multi-element VHF beam was hidden in the average looking attic of this home. Admittedly it may not work as on receive or transmit as well as it would if it was mounted higher up on the outside of the home but it is thoroughly hidden away in the attic. Since this antenna is directional it has the characteristics of other beam antenna in that the transmit signal is higher in strength along with it having the ability to better receive signals that might otherwise be too weak to hear. What Other Ways Can Be Used? There are many but here are a a couple ideas to get your “idea factory” working on your own stealth antenna ideas. This type of stealth antenna has been discussed elsewhere on this web site but it was decided that it should be included on this page. Can’t see the antenna yet? Just take a look at Old Glory wafting in the breeze and you will see the antenna. Give up? It’s the flagpole! These flagpole vertical antennas are popping up all all over the place, especially where outside antennas are restricted or forbidden altogether. 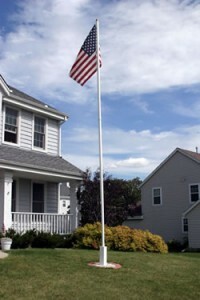 If you wish to erect any sort of flagpole antenna such as this one then you might want to be sure there aren’t restrictions on flagpoles in the area where you wish to erect it. Some homeowner associations have an even more restrictive policy towards communications by stating that no radio emissions are allowed. Of course this would not apply to shortwave listening but it is best to check first. The flagpole antennas are permanent as they require a concrete base under them and this might keep them from being used in some survivalist situations. The owner of this home has built a loop antenna that literally circles his house and no one is the wiser. Take note of the coax exiting the attic vent and running over to the balun1 which is connected to the wire running around the eaves of the house. 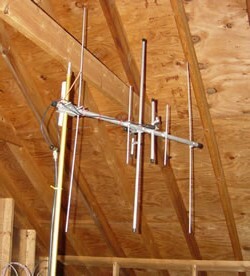 Wire loop antennas like this one are quite effect and stealthy as well. Along with this is the fact that loop antennas tend to be broadbanded and can readily used on more than one band. Well, about the time you think you have seen it all there comes around something like the antenna to the right of your screen. 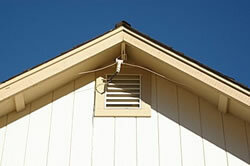 It is manufactured by Rohn Products and should hide any antennas systems contained within fairly well. 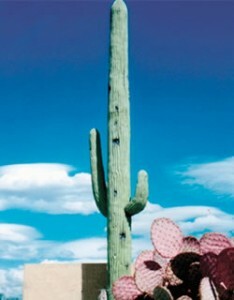 Of course it will also tend to make people stop and point thereby drawing more attention to it than one might desire. Nevertheless, it shows what can be done to hide your antenna. 1 Balun: Derived from the terms “balanced” & “unbalanced”. It is an adapter that converts an unbalanced signal, eg 93 ohm coax to 100 ohm.